Corbett National Park can be the first choice among the wildlife lovers due to its appealing landscape bounties to the visitors and the presence of variant endangered species in the core zones. Established in 1936, the Jim Corbett Tiger Reserve brings mass appeal to its different areas/zones for the explicit India Wildlife Tour and the most fascinating part of the dense jungle of Corbett is its fantabulous residing options that bring meaning to the wildlife holidays. Set up by the government for the convenience of the wildlife experts and tourists, Corbett Reserve is being flourished with different forest lodges which are specifically designed according to the jungle ambience. Complemented with luxuriant services poured into every cottages bring a wonderful and fatigue-free stay at Corbett lodges. The name brings a clear hint that this lodge probably resides in the area of Dhikala zone which is at a distance of 30 km from the Dhangadi gate inside the core areas of Jim Corbett National Park. The perfect location of this resort bounds the guests to throng the most and this is the reason the Dhikala lodge remains filled throughout the year. It is thus advisable to make a prior booking to this lodge for much convenience. Once you are inside the vicinity of the lodge you can find a closer attachment with nature as the home stay is surrounded with ample groves of Sal lined along the flourished Ramganga River. With the hint of basic facilities, the lodge is being supplemented with 22 guest rooms and 24 dormitory beds. So you can make a pre-booking of the lodge from attractive packages along with the Corbett safari to make your experience more rewarding. 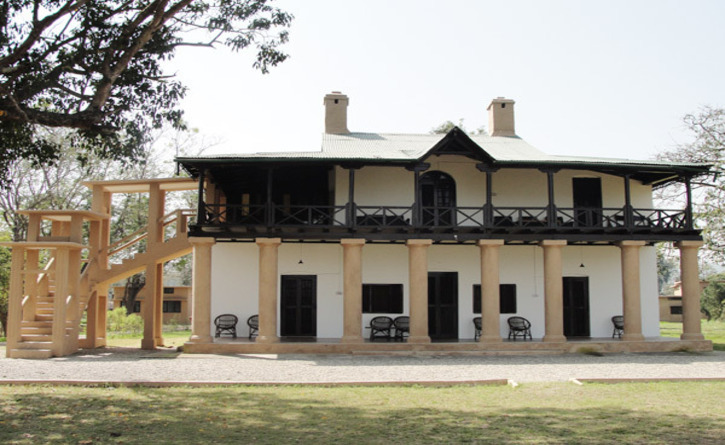 The Sultan Rest house is the first lodge in the area of Dhangarhi-Dhikala road. The name of the lodge is being inspired through the Sultan Sot which is the name of the seasonal stream running through the area. The lodge is being located amidst the dense area of the jungle to bring one of the best stretches of Corbett National Park. So, the guests can enjoy the natural wilderness amidst the lush foliages by leveraging the high class services. The Gairal Rest House is being located at a very short distance from the main routes of Dhangarhi-Dhikala forest road. The rest house has been placed along the riverside of Ramganga at the spot where the Ramganga River first enters the Corbett Park. The Gairal Rest House has one explicit quality of showing a different image at upstream unlike the river flows downstream in Dhikala ranges. Apart from Dhikala, the water of Ramganga River at Gairal brings crystal clear fast inflows along the mountains to reach amidst the dense forests. Thus a stay at Gairal actually lets you mesmerize completely with the panoramic views and the rest house for a lovely and peaceful stay. The area of Bijrani was once considered as the hunting part for the shooting block and was most famed during the British reign as the rulers used the area for hunting purposes. It is also considered as the core zone of Corbett where the residents (guests) can find diverse vegetation because of the presence of drier terrain along with the diverse ranges of wild species. A perfect land for a peaceful natural stay amidst the natural environment, the Bijrani Guest House is the choice of both natural and wildlife lovers. One can find the Jhirna Guest House located on the main Ramnagar-Kalagarh road heading towards the east west directions of Corbett. The place where the guest house is being erected was earlier a small village called Jhirni which was further relocated for conservation purposes and so the region was acclaimed as the Jhirna Zone where the rest houses were also named the same. The area is also being known for the dry scrub vegetation and the area is also being illuminated with the Shivalik landscapes to bring picturesque scenery along with the impressive room services at the Jhirna guest house.